InvestmentNews calls it "the gold bug's dream ETF" -- well, gold bugs come in various shades of gold, and some of them may be difficult to please. I had the more modest goal of bringing to market a physical gold ETF that addresses some of the perceived shortcomings of other ways of investing in gold. 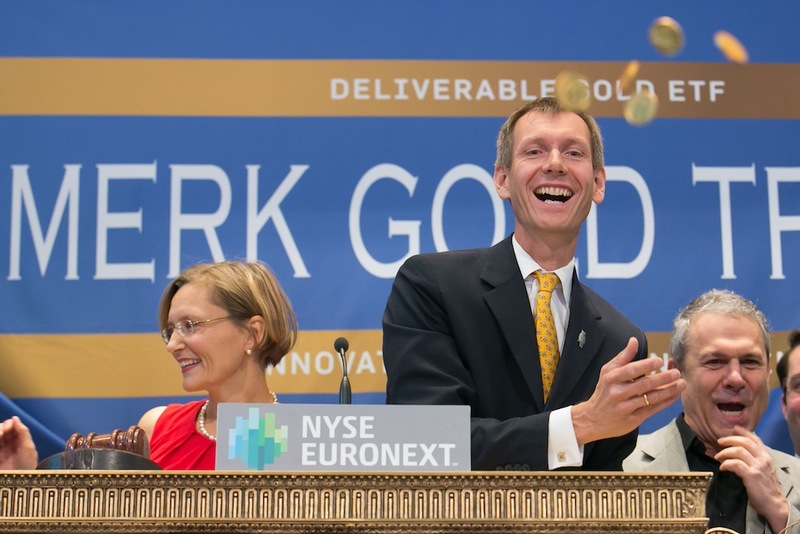 I'll share some of the amazing journey behind the new Merk Gold Trust, a gold ETF that allows investors to take physical delivery of the gold represented by their shares, recently launched on the NYSE. Coming out of the 2008 credit bust, my interpretation of former Fed Chair Bernanke's statements suggests the Fed should firmly err on the side of inflation to avoid removing stimulus too early as it that would cause deflationary forces to dominate once again. To my knowledge, Fed Chair Janet Yellen is the first Fed Chair to suggest the Fed's dual mandate is not a conflict, arguing inflation is not a concern. I get concerned when others are complacent. Yellen appears singularly focused on employment: in her first speech as Fed Chair she discussed how accommodative monetary policy could help people find jobs by telling the story of three people who had trouble finding work but omitted the fact that two had criminal records (which – in my assessment anyway – might explain their struggle to find a job more so than the level of interest rates). More importantly, I don't think we can afford positive real interest rates. Looking at the projections of the Congressional Budget Office (CBO) a decade from now we may be paying over $900 billion a year in interest on government debt (marketable Treasury securities), up from about $200 billion currently. And the CBO does not think the average interest rate we will be paying on our debt will go back up to what has been the historic average; if it were, we would pay $1.2 trillion a year in interest expense alone. Fear not, I don't think this is going to happen; the price for this, however, may well be negative real interest rates, providing a potential catalyst for inflation and a weaker dollar. In Japan, where the challenges are even greater, I cannot see how the government can finance its debt should the reform policies be successful and economic growth ensue. With economic growth the cost of borrowing may rise. In the past we have indicated that our price target for the yen is infinity as we don't think the yen can survive this. Keep in mind that Japan is no Cyprus, so fasten your seat belts in case my forecast becomes reality. In the Eurozone, where we believe it is structurally more difficult to "print money", ECB head, Draghi has said real interest rates are negative and will become even more so. To me, asset allocation is about scenario planning, not whether I’m right or wrong (many years ago, I wrote my Master's Thesis on probabilistic decision making). In my view, investment professionals have a fiduciary duty to take scenarios into account that might have a significant adverse impact on their client portfolio. One does not need to have a negative outlook on the world to like gold. In past Gold Reports and Gold White Papers we have shown that gold has played a valuable role in an optimal portfolio, not just over the past decade but also over many decades, even the past 100 years. The statistical characteristics of gold have historically been attractive. The reason gold raises emotions with many is because an investment in gold suggests that one would rather hold a gold brick than invest in a productive company. But then again, the $20 bill in your pocket also does nothing. The brick, at least, doesn't change - it's the dollar value of the brick that changes. There's a time and place for everything - hence the mantra of diversification. Bernanke used to refer to “the toolbox” of the Fed. Similarly, I believe investors should have a toolbox to be prepared for what may lie ahead. I got to thinking in earnest about this toolbox in 2003 when the then incumbent head of the ECB Wim Duisenberg said, "We hope and pray the global adjustment process will be slow and gradual." --In fact, a reference to a "disorderly adjustment of global imbalances" was a risk cited by the ECB every month in its statement until about the time current head, Draghi, took over. This "adjustment process" is a thinly veiled reference to a potential dollar crash. When I heard central bankers revert to "hopes and prayers", I knew it was time to act; time to create a toolbox. In 2008 we launched the Merk Asian Currency Fund (MEAFX), a fund that seeks to benefit from a rise in Asian currencies versus the U.S. dollar. In 2009 we launched the Merk Absolute Return Currency Fund (MABFX). In response the 2008 financial crisis we wanted to supplement our product offering with something more flexible, creating a tactical currency fund with no ex-ante negative dollar bias. In its early days, however, we missed a major opportunity -- it wasn't until the summer of 2012 that we incorporated into the absolute return strategy what we believe is highly valuable information we gather in the investment process of the Merk Hard Currency Fund. If you consider this Fund please look at its performance since June of 2012; since then, the Fund has become what some refer to as our best ideas Fund - or Merk unconstrained, I like to refer to it as our #CurrencyWars strategy. In fact, we have seen advisers use it as an alternative to some of their bond allocation because its risk profile is historically very much contained while at the same time offering very low correlation to other asset classes. In 2011 we launched a Fund many are not even aware of: an equity fund with a "currency overlay", the Merk Currency Enhanced U.S. Equity Fund (MUSFX). We figured that all the money printing might very well also push up equity prices. But again, we didn't like the products generally in the market. In our analysis, the typical international funds mostly provided more volatility; not true diversification; yet we saw tremendous opportunity due to the insights we have into the currency markets. So we married the concept. The results speak for themselves - if you invest in equities consider this Fund; I have a feeling you will hear a lot more about it. As you might gather by now, we have brought products to market we are passionate about. Because of our public profile we have always had a very engaged audience. That's great in some ways because it helps us in our idea generation process. We may not change our mind but it helps us to consider viewpoints that we might not have looked at otherwise. When we published an analysis called "Draghi's Genius" in August 2012 we got a lot of feedback - none of which was positive. We called the turnaround for the euro and have so far been proven right; at the beginning of the year the Wall Street Journal even praised us in a page A1 article for our “brave” call on the euro. It didn't help us to be right - many investors stayed away from our hard currency strategy in 2012 - the U.S. dollar might be in trouble; the rest of the world looked worse. The challenge we have been facing in recent years is that as we have gotten more sophisticated in the way we address currencies in our products, that sophistication might have scared investors. Even as we frequently simplify complex topics in that we try to make easy to read analysis - often supported by hilarious yet rather serious cartoons - currencies remain something considered exotic by many investors. It's a pity because our analysis shows that between 30% and 50% of international equity returns are due to currencies (both on the upside and downside). Not actively managing currency risk takes investors along for a ride; hedging it out leaves lots of chips on the table. We might think we do the best thing since sliced bread with currencies but the passion of many is with gold, not the Swedish Krona or New Zealand Dollar. We have always considered gold the ultimate hard currency, even as purists have an issue calling gold a currency (to them, gold is money not a currency). Gold gets people more engaged than currencies. 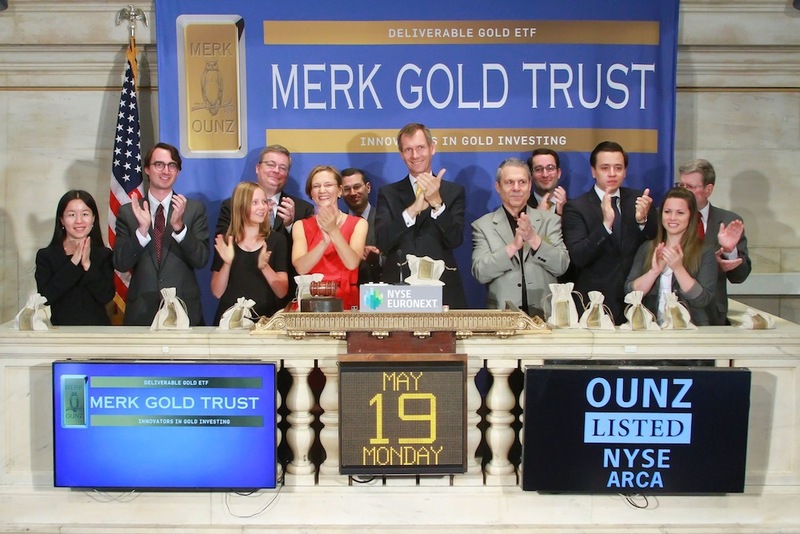 By bringing the Merk Gold ETF (“OUNZ”) to market we learned a great deal. By evaluating many service providers and working closely with them we had to truly understand every aspect of making a physical gold trust work in an exchange trade fund. I also had a very personal reason to make sure this product came to market. You may think I'm a gold bug and I've even been quoted as owning a substantial portion of my non-real estate net worth in gold but the amount of gold I own pales in comparison to the amount of gold the person I consider to be one of the greatest investors of all time owns. That person has provided substantial encouragement during this process. No, I'm not talking about a famous hedge fund manager, and although he was diagnosed with pancreatic cancer last year, the goal of seeing OUNZ come to market has helped him in his fight against cancer and at this time I am extremely happy to report that my dad is reacting well to chemotherapy and is looking forward to OUNZ's success. Through my involvement in this process I have met gold investors of all sizes. No matter how large or how small an investor one is, investment goals generally include, at a minimum, the preservation of purchasing power. I have had discussions with individuals worth hundreds of millions asking me how to best hold larger amounts of gold. There are lots of ways to hold gold and all come with advantages as well as potential challenges. We only bring products to market we truly believe in. Sometimes investors are concerned about investing in a new ETF; they might veer towards the most established product because of 'higher liquidity'. Especially with regard to precious metals ETFs, these concerns may be unfounded. ETFs generally trade near their net asset value because market makers have an arbitrage opportunity when the share price deviates from the underlying net asset value (I’ll dive into how the ETF market works in more detail in an upcoming Insight – subscribe, so you don’t miss the coverage). The good news for a gold product is that market makers can aggregate its entire gold exposure across multiple products, allowing them to offer very tight spreads (the difference between bid and ask prices) in a young product such as OUNZ. For OUNZ, tracking the price of gold is a secondary objective. Our first priority is to allow investors to invest in physical gold through an ETF with the option to take delivery. But that doesn't mean we don't take the secondary objective seriously. We wanted to design a product robust enough to allow large numbers of investors to have their gold delivered should the need occur. However, we learned that many custodians have little desire to open their vault frequently in order to allow investors to take delivery of their gold. We had numerous discussions with firms that work only in the gold storage business, not the banking business. While it was enlightening to visit their vaults in the U.S. and abroad, we realized that we could not design an exchange traded product that sufficiently addressed our concerns. We learned that some banks that deal in gold are not even aware that they cannot offer allocated gold. Some service providers we evaluated did not meet our standards when we performed our due diligence. We determined the best way to define our goals for this product was to develop “Guiding Principles”. Based upon the process created the U.S. patent office granted us U.S. patent #8,626,641. Compared to the biggest player in the market, we believe OUNZ is offering more value by allowing investors to take delivery of their gold. Others in the industry are quick to point out that their gold ETF also allows delivery – but evidently only to a select few “Authorized Participants”. Some gold ETFs store their gold in Switzerland or other places. OUNZ holds its gold in London. The reason we chose London is because, in our analysis, it has been the most consistent and reliable market over the years. I realize not all bloggers agree with that assessment but Switzerland, for example, may not be living up to its reputation – I would like to point to the changes in Swiss law over the years that make Switzerland not the easiest partner to work with. As an example, Swiss bank secrecy these days may have as many holes as Swiss cheese. Having said that, I don’t object to geographic diversification of gold holdings. Indeed, at the Merk Gold Trust (OUNZ), we are able to have the gold moved to additional or new custodians should our confidence in London erode. Did I mention that we feel so strongly about gold that we designed OUNZ so it does not need to sell gold to pay ordinary expenses? That’s because we pay these expenses from the “Sponsor fee” of 0.4% per annum we receive. But instead of receiving cash we get paid in gold: we get paid in shares of OUNZ (causing an annual dilution equivalent to the expense ratio of 0.4%). Given that OUNZ shares represent a pro-rata ownership in gold, we get paid in gold. The best way to show your support for OUNZ and the innovation we bring to the market is to put your money where your mouth is, i.e. consider OUNZ in your portfolio allocation. If you are an investment professional consider OUNZ in your clients’ portfolio allocation. If you write, tell others about OUNZ. If we see investors embrace OUNZ, we will be encouraged to bring further information to the market. We think OUNZ is off to a great start but it’s only a start. You can help us make it the new standard as to how a gold ETF should work. For more information on OUNZ, click here. To receive the free Merk Insights, click here. Since the Funds primarily invest in foreign currencies, changes in currency exchange rates affect the value of what the Funds own and the price of the Funds’ shares. Investing in foreign instruments bears a greater risk than investing in domestic instruments for reasons such as volatility of currency exchange rates and, in some cases, limited geographic focus, political and economic instability, emerging market risk, and relatively illiquid markets. The Funds are subject to interest rate risk, which is the risk that debt securities in the Funds’ portfolio will decline in value because of increases in market interest rates. The Funds may also invest in derivative securities, such as forward contracts, which can be volatile and involve various types and degrees of risk. If the U.S. dollar fluctuates in value against currencies the Funds are exposed to, your investment may also fluctuate in value. The Merk Currency Enhanced U.S. Equity Fund may invest in exchange traded funds (“ETFs”). Like stocks, ETFs are subject to fluctuations in market value, may trade at prices above or below net asset value and are subject to direct, as well as indirect fees and expenses. As a non-diversified fund, the Merk Hard Currency Fund will be subject to more investment risk and potential for volatility than a diversified fund because its portfolio may, at times, focus on a limited number of issuers. This article references individual securities that may or may not currently be held by a Merk Fund. Click here to view important information about the Funds, including their holdings. The views in these article excerpts and hyperlinks were those of the Fund's manager as of each article's publication date and may be subject to change. The material must be preceded or accompanied by a prospectus. Before investing you should carefully read and consider the Merk Gold Trust's ("Trust") investment objectives, risks, charges and expenses. The request for redemption of shares for gold is subject to a number of risks including but not limited to the potential for the price of gold to decline during the time between the submission of the request and delivery. Delivery may take considerable time depending on your location. All rights reserved. Merk Gold Trust and OUNZ are trademarks of Merk investments LLC in the United States and elsewhere. All other trademarks, service marks or registered trademarks are the property of their respective owners.